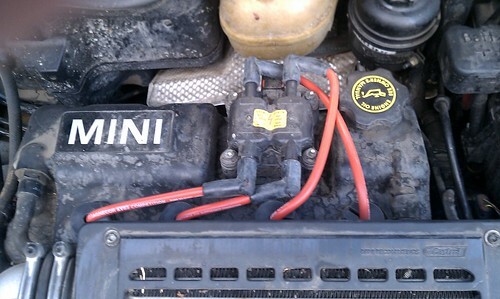 Inspired by the automechanical prowess over at dbmini I finally got around to changing my spark plugs at the weekend. I’d purchased them over a month ago but had never gotten round to buying the wrench and appropriate socket attachments. I’m a software guy, not many tools in my house. The task was no less easy then db said it would be though I had changed spark plugs before, back in my old Mini Metro in the 80’s. Only one of the plugs gave some resistance, and I worried about trying too hard to get it loose and breaking it in the socket. Don’t know how I would get it out if I did that! Can’t have taken more than 10 minutes for the whole thing, though I did scuff up some fingers: there was blood. Whole thing cost me $40 for the plugs and $35 for the toolkit plus tax and all. The garage that does my oil changes quoted me $260 so I saved me a chunk of change. So much so, that I bought some new leads to pretty it up under the bonnet. Not sure there is any more DIY in my future. I wouldn’t mind having a go at the brake pads since everyone tells me that’s so easy but, again, no tools or anything so might as well just take it to someone who does. Readers of my every day blog will already know that after years of being an Apple fanboy I’ve had it with them for a while, and ditched my iPhone for the new Droid Incredible. So far I’ve been real impressed with the Incredible, the experience is on a par with, if not superior to my old 3G iPhone. And it’s fast, so much faster. Anyway, being a Google device it comes with the google naviagation app which I put to the test last week for my drive home. 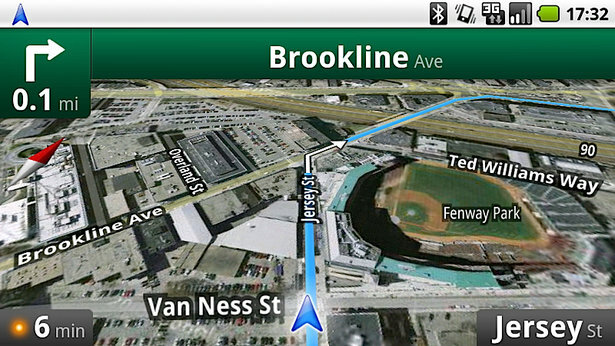 The application combines Google Maps with turn by turn voice directions as well as speak to search for nearby things. Unfortunately I don’t have a mount for the phone yet so had to balance the phone precariously on the cup holder and after the second time it fell on the floor I put it on the seat. Some of the cool things about the application are that you can add the regular google layers to it: real time traffic, street view etc. The map display auto zooms depending on the distance to the next turn or, it seems, the complexity of it. Freeway ramps became full screen clearly showing me where to go. On Verizon my journey home is almost all 3G covered (as opposed to the 30% that AT&T covers) so the map updated very well. It’s not without downsides: for example, I can’t find a way to save locations, have to type in my home address each time. But for a free application it’s very well featured. And with Android having real multitasking I could drive home with Pandora playing through my MINI speakers (thanks to the AUX input) while the map was displayed: the sound would be auto-muted every time the navigation wanted to tell me something. When new gmail arrived I could browse it, still listening to Pandora, and still listening to the turn by turn – very cool, indeed. And the method of switching between tasks is easy and intuitive. I’ll be interested to see just how well this works with iPhone OS4. To me, the Sense UI on the Incredible gets it just right.